The newly developed TiltPrevention function in Bystronic’s BySoft 7 software means users can now create cutting sequences that reduce the likelihood of parts tilting and causing a collision with the nozzle as it travels over the sheet. If an impact does occur, the job has to be stopped while the situation is rectified, causing loss of production, potential scrap components and, in the worst case, damage to the cutting head. From a traditional perspective, inclusion in the cutting program of micro joints or tabs to keep components in place has been a way of preventing parts from lifting, but this results in subsequent time-consuming shaking of the components from the skeleton after the nest has been cut. There is also the added complication that broken tabs leave burrs that may have to be removed. 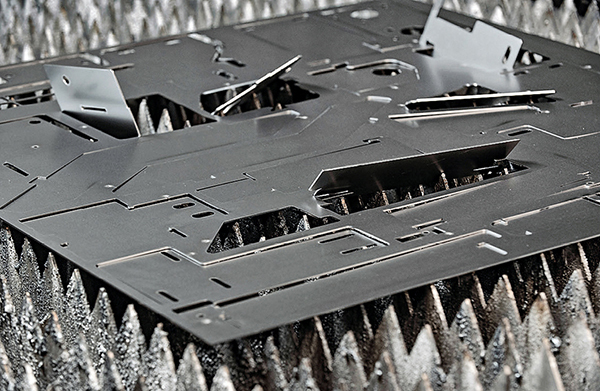 The alternative approach from Bystronic is to use software that can guide the path of the laser head during the cutting process so that, as far as possible, it avoids risky sections in a cycle where parts could tilt. This function largely eliminates the need for micro joints. A special algorithm calculates the likely mechanical behaviour of each part before it is cut from a sheet, taking into account a range of parameters, including the density of the material, the geometry and weight of the component, the pressure of the assist gas flow, and the positioning of the nested parts on the sheet. TiltPrevention then recommends the start and end points of the laser nozzle so that any tilting of the parts after cutting is prevented as far as possible. In addition, the function proposes the best possible route for the head over the metal sheet, creating an optimised cutting sequence for all components on the plan.